I can’t find my winter coat. I looked under the bed and in the closet. It’s gotta be somewhere? Are you looking for your coat? It’s getting chilly in Brooklyn. 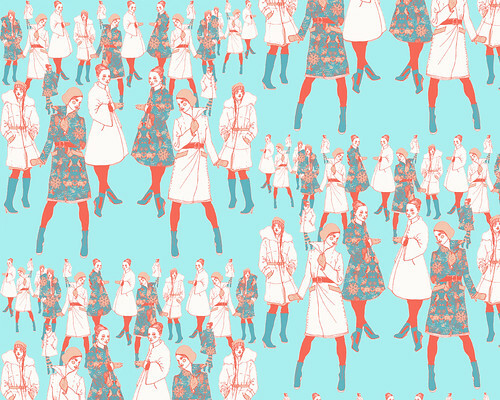 Here’s a new pattern I made of girls in coats. I’d like to have any of these. I don’t think red tights would look flattering on me though. i think i’ll be getting a vintage coat from a goodwill thriftstore or a nice new one from topshop online. oh let me know what you get when you get it! I’ve seen a few good ones lately in thrift shops. I cute cropped military one and a belted 50’s one….but before I give myself the license to buy one I need to look more carefully for my old ones. I think they’re at my in law’s place in their closet. We moved to a new apt last year in Jan. so we must have put them there for safe keeping. Anyway lots of great coats out there. Def keep me posted on your purchases! super cute print! i’m getting my new one altered and can’t wait to wear it–believe it or not, it’s getting cold here too. Oh I can only imagine….cold in southern Cali….what’s that like 60 degrees?!! I’m sure you got a gorgeous coat. What does it look like? Thanks girls!!!! You are the sweetest!